Although the hospitals to the rear may have been spared some of the dangers of war, the horrors of war were still very apparent as P.C. Ettighoffer describes in "Gespenster am toten Mann". Having been wounded he and his comrades are told it would be faster to make their way to the hospital at the rear on their own steam, which they do. "The entrance to the hospital is large, high and tiled. It resembles a bathhouse or an abattoir.... We lightly wounded sit around on benches and wait for the medics who look after us one by one. In front of us, on stretchers, lay the badly wounded. They lay there under blood soaked covers, moaning, most with stomach wounds. One of them cries "Water! Water! Water!" "We need to help him," says Bienemann, "they have forgotten the poor beggar." He is already taking out his field flask, it was filled with tea and rum and lots of sugar. We had been given the drink at the field kitchen in Lens. They had not spared the rum, it was damn strong stuff and went right to the head. "Hey comrade," said Bienemann, "what kind of wound do you have?" "Nothing internal? You are allowed to drink?" The soldier assured he had nothing on the body, just the legs, and the medics refused to give him a drink, although he had been asking for over 2 hours. He takes the offered flask and puts it to his mouth. He drinks and drinks. He empties it to the last drop and them gives it back with a thankful grin. A half hour later the Sanitäts-Feldwebel comes in and looks at the soldier. "Man! What have you done! Have you been drinking? You have surely not been drinking ?" No…. he has not been drinking the wounded man lies. "Who gave this man something to drink?" the Feldwebel asks as with anger flashing in his eyes. Bienemann steps forward. The Feldwebel disappears and comes back with a Stabsarzt. The doctor’s hands are covered in blood. His apron is also covered in blood. He has been operating in the next room, without a jacket or shirt, just a thin vest covers his torso and his officer’s rank is only recognisable by his hat. 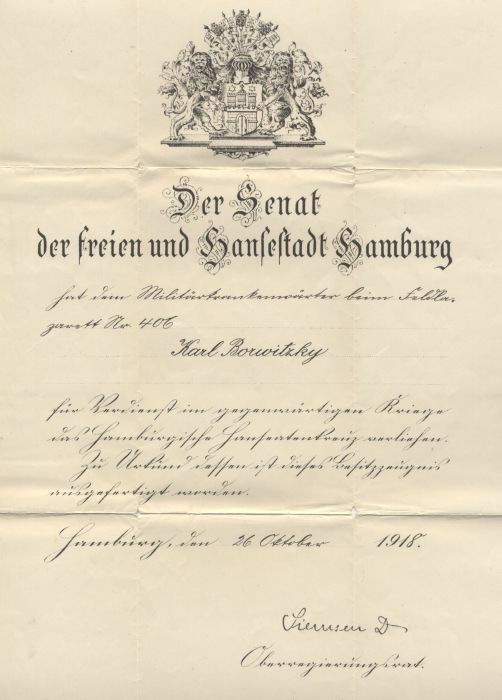 Above: The Iron Cross 2nd class award document to Krankenanwärter Carl Borwitzky, serving in the 406th Field Hospital of the 203rd Infantry Division, fighting on the Marne and in the Siegfriedstellung at the end of 1918. He looks at Bienemann "You gave him something to drink? You are the murderer of your comrade, always remember that!" Bienemann defends himself excitedly. The doctor listens then turns to the soldier. "So, it is your own fault... I told you, you cannot drink anything. You have no chance now, do you hear me? There is now no force in the world that can save you now, you poor, poor fool." "Herr Doctor.... please, save me!" moaned the wounded man, "I don’t want to die, I did not know about the stomach wound, I only knew about the leg wound. Herr Doctor.... I am only 18, please...!" 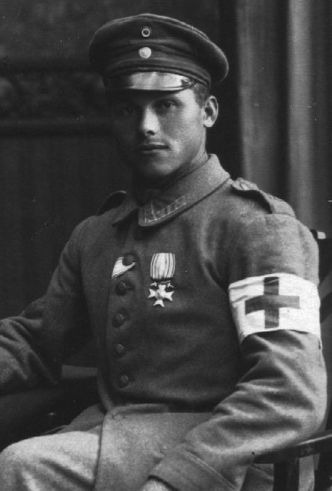 He tries to stand but is held down by two lightly wounded at the command of the Feldwebel. "The syringe..." says the doctor to the Feldwebel as he leaves the room. The Feldwebel nods and exits coming back with a large syringe filled with morphine. "Come old man, this won't hurt, it will be a relief. It will calm you, come, give me your left arm. 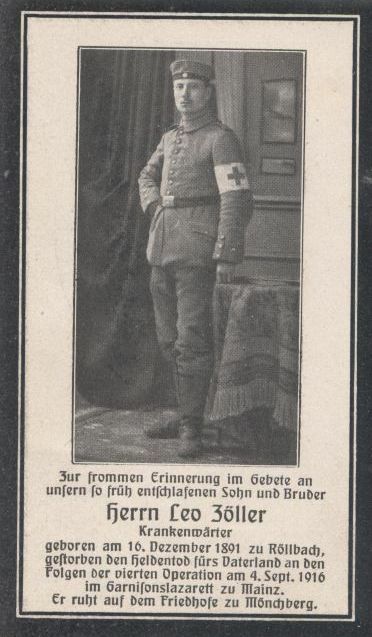 There you go..."
Right: A Bavarian Medical NCO. Half an hour later the man acts strangely, becomes rigid. He stretches, tries to stand, he does not succeed. He glances around, wild eyed then pulls the blanket tightly around him, flattening the wrinkles with his hand. His head jerks to the left. He pulls the blanket over his head and lays still. The Feldwebel comes and establishes the death of the soldier without emotion. "Without your damned drink we could probably have saved him." he says. The next night we are put on a Lazarettezug and are rolling through Belgium on our way home. They do not want to leave us behind the front as the fighting on the Loretto heights is intensifying and they will need the space. 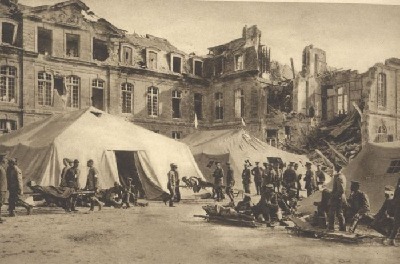 All transportable wounded were to be packed off home. After a journey of 36 hours we arrive. A small town is waiting for us. 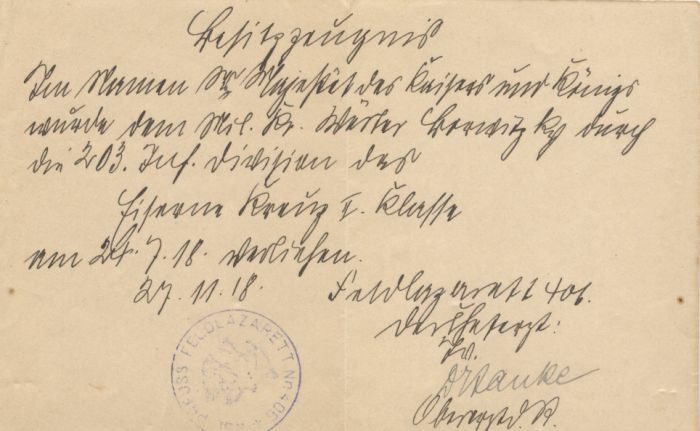 The mayor of the town had officially requested that an ersatz battalion or hospital be stationed in his town. Two dancehalls had been refitted as hospitals and nuns from the local convent were at hand. Large amounts of tobacco and mineral water had been delivered to the town as had 300 army field beds. In this well prepared town arrived our train, direct from the bloody Loretto heights"
Above: The award document for Karl Borwitzky's Hamburg Hanseatic Cross award document.